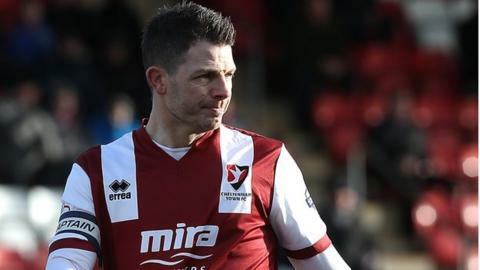 Cheltenham Town have released veteran striker Jamie Cureton. The 38-year-old signed for the Robins last summer on a one-year contract, following his release from League Two rivals Exeter. Cureton made 24 starts and 12 substitute appearances for Cheltenham, scoring 11 goals. The former Norwich and Bristol Rovers forward has completed 20 seasons in the Football League and has played for 12 different clubs. "I want to freshen it up and I want a younger squad," manager Mark Yates told the club website. "Jamie has scored 11 goals and could have had a few more for us but I just want to go in a slightly different direction. "I've felt at times that I have tried to accommodate two strikers when perhaps it hasn't suited the rest of the team." Yates added: "He has been a model pro for us in terms of his attitude because he is first in at the training ground and looks after himself. Cureton has made 750 appearances during his career and scored 258 goals in all competitions. Cheltenham confirmed their retained list on Tuesday but Cureton's meeting with manager Mark Yates was delayed as the player was on a coaching course. Sido Jombati, Ashley Vincent, Ed Williams and Sam Deering have also been released by the club.